This past weekend, Goshen College hosted the 19th annual conference on religion and science. The conference included a series of lectures, two of which were open to the public, as well as multiple discussion sessions that were reserved for registered participants. The keynote speaker was Katharine Hayhoe, an atmospheric climate scientist and a professor and director of the Climate Science Center at Texas Tech University. 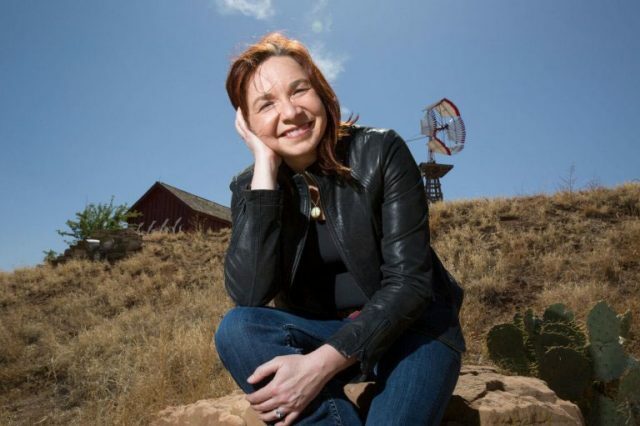 Hayhoe’s research focuses on developing and applying high-resolution climate projections in order to better understand what climate change means for people and their natural environment. “Evidence of climate change is our own backyards,” Hayhoe said in the lecture. She explained that rising sea levels, earlier bloom dates, melting glaciers and more extreme weather events are among the 26,500 indicators that our planet is warming. Using color-coded maps of the United States produced by Yale University, Hayhoe explained that the root of the problem is the fact that many people believe climate change is real but they do not believe it will affect them personally. Hayhoe’s second public lecture was titled “Christians, Climate, and Culture” and was presented on Saturday morning. During this lecture she shifted her focus from scientific data to a more religious perspective on climate change. Hayhoe noted that some Christians object to the climate change movement because they believe that removing fossil fuels will cause more suffering. Hayhoe provided four reasons why this is not the case. First, most poor countries do not have fossil fuels. Second, there is a large price tag for extracting fossil fuels, and this is paid for by the locals. Third, the combustion of fossil fuels and wood is the main source of air pollution. It causes approximately nine million deaths annually and it disproportionately affects the poor. Lastly, the emissions that result from burning fossil fuels produce heat trapping gases that cause climate change. Hayhoe said that one of the most common questions people ask her is if it is too late to prevent climate change. She always responds with the same analogy: Would a doctor tell a smoker it is too late to quit smoking? No. The doctor would say that while it is too late to prevent the damage that has already been done, quitting can still improve future outcomes. Reflecting on the conference and the future of climate change, Paul Meyer-Reimer, professor of physics, said, “The greatest uncertainty in all of her models is what humans will do.” There is no way to anticipate this variable when predicting the future of climate change. Hayhoe suggests that it is not necessary to change people, but rather reveal to them how their own personal truths and core values can motivate them to support climate change. Begin by finding a way to bond and connect with the other person; do not start the conversation with something you already disagree on. Explain why climate change is happening using examples that have affected both parties involved in the conversation. Attempt to inspire the other person by asking them how the two of you can work together to tackle the problem in a way that is compatible with both sets of individual beliefs. Thank you for your report on this important conference! We need to find a way to talk to others about this crucial issue, even if they have differing opinions!